To say that Rachel's husband Tom ruined Christmas is a bit of an understatement. It was Christmas Eve, and Rachel was bursting with holiday cheer. The next thing she knows, she out in the snow, alone and scared. Tom has told her he's hired a contract killer to take her out that very night, forcing her on a long bizarre journey away from her family and into a strange new life. 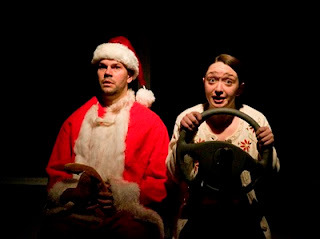 If you like your comedy dark and your holiday fare unconventional, City Theater Company's "Reckless," directed by George Tietze, is right up your alley. As Rachel, Victoria Rose Bonito does a flawless job of bringing her character's troubled, over-the-top bubbliness to life. 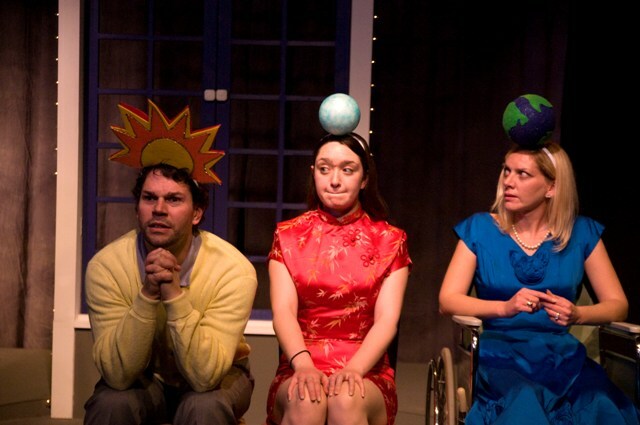 Bonito, making her City Theater Company debut, is the backbone of the show -- I don't recall a minute when she wasn't on stage -- and there was never a dull moment. The rest of the small cast is made up of CTC veterans: Jim Burns and Kerry Kristine McElrone as Lloyd and Pooty, the couple who take Rachel in (and who are not quite what they seem); Maggie Cogswell and Tom Holtsberry in several scene-stealing roles, including a shady office supervisor and a game show host; Michelle Jacob as all six of Rachel's very different therapists over the years; and Eric Longo as Tom and Tom Jr. A solid cast all around. The opening night show was a blast, despite some technical difficulties. For the record, I thought the cast doing the music and recorded soundtrack live was terrific -- I didn't guess it was a SNAFU, if anything I thought using live acapella voices for the music was a clever touch. 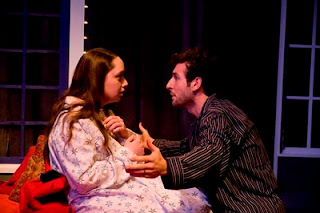 "Reckless" is playing at The Black Box at OperaDelaware Studios through December 18. For tickets, click here. Cute story, I'm joe Connor from the Addictions Coalition of DE I have been trying to reach you all about an event we are doiing in February.